There's an admirer of Royal Enfield motorcycles who is sleepless in Seattle tonight, dreaming of a girl he may never meet again. She sounds like a real heart breaker. Or, maybe, more like Rosie the Riveter. Whoever this woman is, she rides a Royal Enfield Military model motorcycle. "Saw you at BackfireMoto in Ballard last night. I think you caught me staring a little too long, maybe you didn't notice. I happened to notice that you left on one of the bikes I liked most at the event — a Military Royal Enfield with 'Tank Girl' painted on it. Write to me, at least let me introduce myself. I was wearing a bright yellow shirt and black cargo pants." The only signature the fellow put on the add was "m4w", which I am told is CraigsList code meaning "Male For Women." In other words, he is a heterosexual male. ''Tank Girl'' rider, are you out there? Check your local CraigsList for personals under "missed connections" for a "Reply to This Message" button. 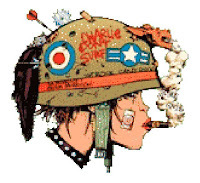 OBVIOUSLY TANK GIRL WOULD RIDE A MILITARY ROYAL ENFIELD. why was this not clear to me before! good lord, this will definitely keep me from ever posting an ad on craigslist again. I am the author of that 'missed connections' ad. As for the lady in question, I know who she is now, but I am happily involved with someone else. I still have a thing for royal enfolds, however.... Someday. er, enfields. Autocorrect you so funny.